WASHINGTON, DC—This week, Representative Derek Kilmer (D-WA) hosted Representative Steve Womack (R-AR) for a bipartisan exchange that highlighted the ways the federal budget affects the unique culture and economy of Puget Sound and the Olympic Peninsula. Rep. Womack is the Chairman of the House Budget Committee and the Co-Chair of the Joint Select Committee on Budget and Appropriations Process Reform, on which Kilmer also serves. Kilmer hosted Womack from Sunday morning until Tuesday morning. 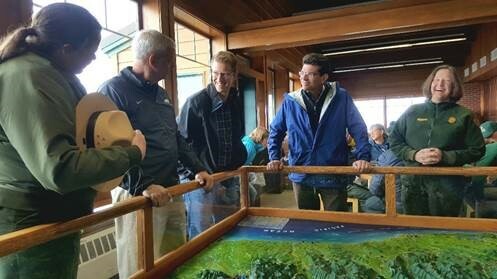 The visit started with a trip to Olympic National Park where Kilmer and Womack received an update on the backlog of park maintenance projects at Olympic National Park and throughout the National Parks System. The National Park Service cannot address the $12 billion backlog of maintenance projects throughout the National Parks System until Congress finds a long term way to pay for the work. Kilmer recently helped introduce the bipartisan Restore our Parks and Public Lands Act which would supply the National Park Service and the other federal agencies responsible for maintaining public lands with the funds they need to address the backlog. The bill cleared an important hurdle last week when it passed out of the House’s Natural Resources Committee. After the update from park officials, members of the Lower Elwha Klallam Tribe including Chairwoman Frances Charles joined Kilmer and Womack as they viewed the Elwha Dam removal project. According to National Geographic, the dam removal project, which received significant federal investment, was the largest project of its kind ever undertaken worldwide. Since the dam’s removal, The Seattle Times has reported the watershed is “booming with new life” including salmon, which are the primary food source for the region’s iconic but endangered Southern Resident Killer Whales. On Monday morning, the tour continued at the Port of Tacoma. 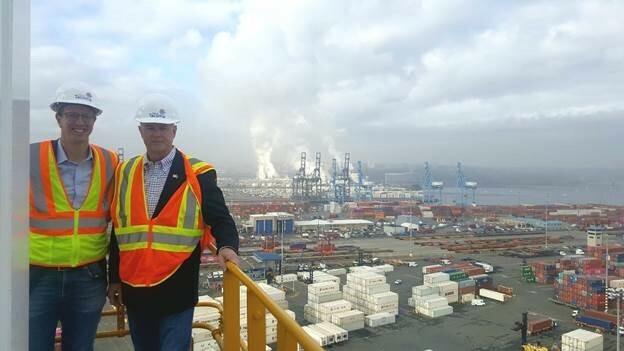 Kilmer chose to bring Representative Womack to the port because it is part of the Northwest Seaport Alliance, which also includes the Port of Seattle. According to the Alliance, 22 percent of the container imports that end up in Rep. Womack’s home state of Arkansas pass through one of the Northwest Seaport Alliance’s ports on the way. Kilmer and Womack have both worked to increase Congress’s investment in infrastructure that would help speed commerce at the port, ease congestion on I-5 and ultimately help the port’s goods move faster to their final destinations. 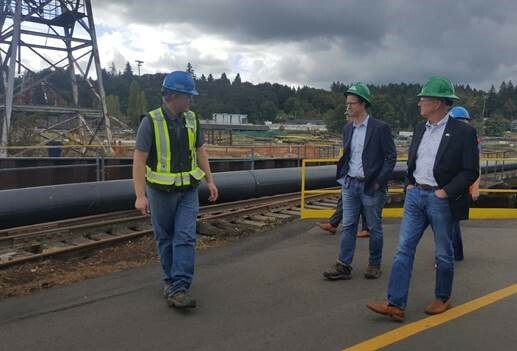 Following the Port visit, Kilmer brought Rep. Womack with him to celebrate the opening of a new Sierra Pacific Industries timber mill in Shelton. The company’s investment in the mill, Kilmer said at the event, was an investment “in the tradition of forest products in this region that is more than a century old and an acknowledgement that this industry has been – and will continue to be – an important leg of our economic stool in this region. Representative Denny Heck, who represents the area where the timber mill is located, also spoke at the ceremony. Last week, the House of Representatives passed a bipartisan spending bill which directed the Department of Defense to expand the use of advanced wood products in the construction of military facilities. 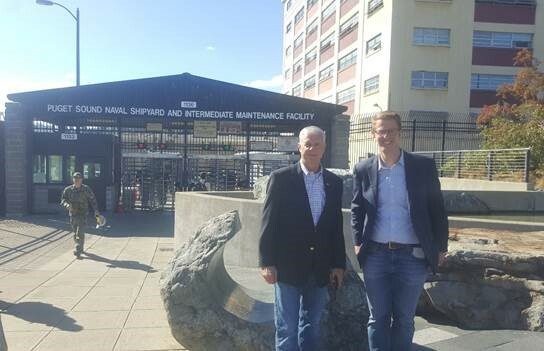 Kilmer ended the exchange by bringing Rep. Womack to the Puget Sound Naval Shipyard. The Puget Sound Naval Shipyard maintains the Navy’s Pacific Fleet. When gridlock shuts down the government, tens of thousands of federal workers at the shipyard and throughout the region receive furlough notices, the maintenance happening at the shipyard is suspended, and government funds are wasted temporarily stopping and starting projects. After a government shutdown earlier this year, Congress created the Joint Select Committee on Budget and Appropriations Process Reform. Rep. Womack is the committee’s co-chairman and Rep. Kilmer is a member. The bipartisan group of 8 Representatives and 8 Senators on the committee is tasked with presenting solutions to prevent future shutdowns before December. 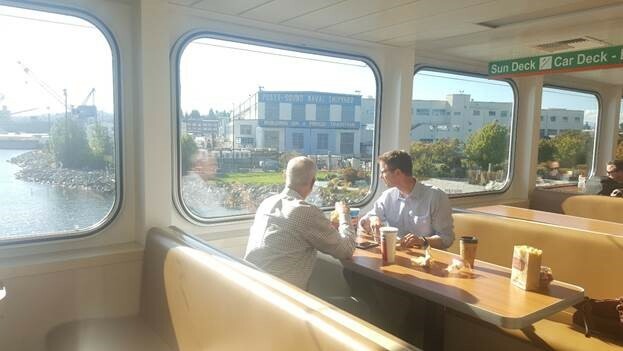 After visiting the shipyard, Kilmer and Womack shared a meal on the ferry ride to Seattle to close out the tour.